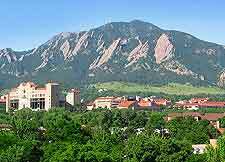 An attractive and fun city quite unlike many others in Colorado, Boulder may not be filled with traditional sights and tourism opportunities as such, although its proximity to a major mountain parks system is responsible for much of its understandable popularity. 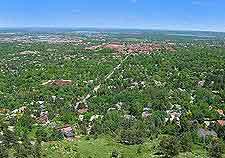 Boulder is also home to the University of Colorado campus, where more than 30,000 students provide a definite youthful vibe to the city, especially around the University Hill district. Downtown Boulder is the place to come shopping and contains the exceptional open-air Pearl Street Mall at its very core, while nearby restaurants line stretches such as Broadway and Walnut Street. Pearl Street is where you will find the Boulder Visitors Center, which provides current tourist information and Internet access. Located on Yarmouth Avenue, the USFS Boulder Ranger District is the place to come for information about the national forests of Arapaho and Roosevelt. Close to the city and lying to the west, the famous sandstone Flatirons provide a splendid mountainous backdrop to much of the city. Pearl Street is very central to life in Boulder and where many locals choose to hang out. In the summer, the Chautauqua Park soon fills up, particularly when the acclaimed Boulder Symphony Orchestra is performing there. Hiking in a major pastime around the city, and visiting tourists should consider spending a day exploring the Boulder Creek Trail, which leads to the Four Mile Canyon. Just a few miles to the south, the Eldorado Canyon State Park is a must see, particularly if you enjoy mountain climbing or picnicking. 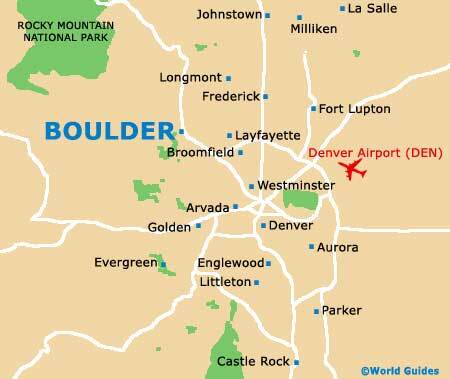 More information about Boulder Tourist Attractions. Many sights around Boulder dominate the skyline, with the Flagstaff Mountain being easily recognizable close by. Visitors to Flagstaff Mountain can follow the Baseline Road to the very top, where the Summit Nature Center awaits. For recreational activities, the Boulder Reservoir offers everything from fishing and swimming, to sailing and sunbathing, with its sandy beachfront being a summer highlight. For something a little more dramatic, head down the Canyon Boulevard to the Boulder Falls, where a spectacular canyon waterfall can be observed close up. One of the city's most significant man-made landmarks is the Fox Theater, which is more than 80 years old and currently attracts a number of major rock stars, passing by on their way to Denver. More information about Boulder Landmarks and Monuments. 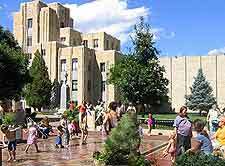 Information about the rich heritage of the city and this area of Colorado can be found within the Boulder History Museum on Euclid Avenue, and also at both the Carnegie Branch Library for Local History and the Heritage Center at the University of Colorado. The city's plentiful museums also cover additional topics such as weather patterns, timekeeping, mining and art, with both the Boulder Museum of Contemporary Art and the Ken Bernstein Art Studio being especially impressive galleries. 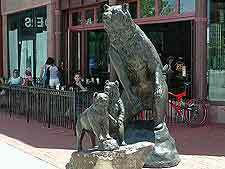 More information about Boulder Museums and Boulder Art Galleries. This part of Colorado has plenty to offer tourists based in Boulder, and those with a car will find a number of important towns and cities surprisingly close by. These include Aurora, Colorado Springs and of course Denver, which is just 45 minutes away and great place for children, who will always enjoy spending a day at the Six Flags Elitch Gardens theme park. If you prefer the 'great outdoors', then Boulder won't disappoint on that front either, being near to the Eldorado Canyon State Park, the Golden Gate Canyon State Park and the Eldora Mountain Resort, which becomes a leading winter ski resort when snow falls. Also nearby is Estes Park and its adjoining Rocky Mountain National Park. 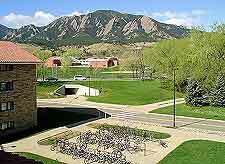 More information about Boulder Attractions Nearby.